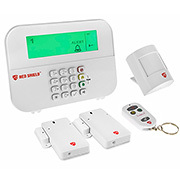 Wire-Free Home Alarm System(WS Series) is the basis for a comprehensive home security system which is designed for convenience and easy installation and yet offering many options for expansion and upgrading according to individual requirements. The system is designed to be compact and discreet avoiding the use of wires and thus allowing sensors to be placed at key points where it will be most effective. The various devices communicate through radio frequency and can function in a typical home sized area or up to 150m away.